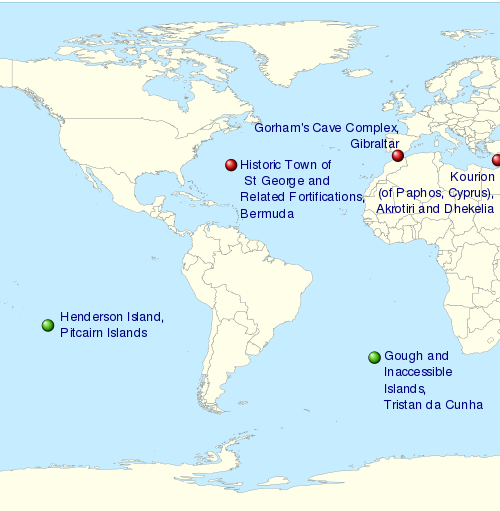 The World Heritage Sites of the UK (Overseas Territories): The natural sites of Gough and Inaccessible Islands and Henderson Island are marked green, the cultural site of the Historic Town of St George and Related Fortifications, Bermuda is marked red. i, iv Before the Dissolution of the Monasteries in the mid-16th century, Fountains Abbey was one of the largest and richest Cistercian abbeys in Britain and is one of only a few that survives from the 12th century. The later garden, which incorporates the abbey, survives to a large extent in its original design and influenced garden design in Europe. i, ii, iii The Neolithic sites of Avebury and Stonehenge are two of the largest and most famous megalithic monuments in the world. They relate to man's interaction with his environment. The purpose of the henges has been a source of speculation, with suggestions ranging from ceremonial to interpreting the cosmos. "Associated sites" includes Silbury Hill, Beckhampton Avenue, and West Kennet Avenue. i, iii, iv ปราสาทแห่งโบมาริส (Beaumaris) และฮาร์เลค (Harlech) (ส่วนใหญ่เป็นงานของวิศวกรทางการทหารที่ยิ่งใหญ่ที่สุดของยุคนั้น คือเจมส์ ออฟ เซนต์ จอร์จ/ James of St George) และกลุ่มป้อมปราการแห่งคาร์นาฟอน (Caernafon) และคอนวี (Conwy) ตั้งอยู่ในเขตที่แต่เดิมเป็นแคว้นกวิเน็ดด์ (Gwynedd) ในเวลส์เหนือ (north Wales) โบราณสถานที่ยังได้รับการอนุรักษ์ในสภาพที่ดียิ่งแหล่งนี้ เป็นตัวอย่างของการล่าอาณานิคมและงานด้านการป้องกันที่ดำเนินอยู่ตลอดรัชสมัยของพระเจ้าเอ็ดเวิร์ดที่ ๑ (Edward I คริสต์ศักราช ๑๒๗๒-๑๓๐๗/ พุทธศักราช ๑๘๑๕–๑๘๕๐) และสถาปัตยกรรมทางการทหารของช่วงเวลานั้น . ii, iii, iv Although inhabited for over 2,000 years, the isolated archipelago of St Kilda has had no permanent residents since 1930. The islands' human heritage includes various unique architectural features from the historic and prehistoric periods. St Kilda is also a breeding ground for many important seabird species including the world's largest colony of gannets and up to 136,000 pairs of puffins. ii, iv Blenheim Palace, the residence of John Churchill, 1st Duke of Marlborough, was designed by architects John Vanbrugh and Nicholas Hawksmoor. The associated park was landscaped by Capability Brown. The palace celebrated victory over the French and is significant for establishing English Romantic Architecture as a separate entity from French Classical Architecture. i, ii, iv The site has been involved in the administration of England since the 11th century, and later the United Kingdom. Since the coronation of William the Conqueror, all English and British monarchs have been crowned at Westminster Abbey. Westminster Palace, home to the British Parliament, is an example of Gothic Revival architecture; St Margaret's Church is the palace's parish church, and although it pre-dates the palace and was built in the 11th century, it has been rebuilt since. i, ii, iv Founded by the Romans as a spa, an important centre of the wool industry in the medieval period, and a spa town in the 18th century, Bath has a varied history. The city is preserved for its Roman remains and Palladian architecture. ii, iv, vi Prompted by Richard Arkwright's factory system developed in the Derwent Valley, the community of New Lanark was created to provide housing for workers at the mills. Philanthropist Robert Owen bought the site and turned it into a model community, providing public facilities, education, and supporting factory reform. ii, iii, iv Hadrian's Wall was built in 122 AD and the Antonine Wall was constructed in 142 AD to defend the Roman Empire from "barbarians". The World Heritage Site was previously listed as Hadrian's Wall alone, but was later expanded to include all the frontiers of the Roman Empire at its zenith in the 2nd century, ranging from Antonine's Wall in the north to Trajan's Wall in eastern Europe. ii, iv Begun by William the Conqueror in 1066 during the Norman conquest of England, the Tower of London is a symbol of power and an example of Norman military architecture that spread across England. Additions by Henry III and Edward I in the 13th century made the castle one of the most influential buildings of its kind in England. i, ii, vi St Martin's Church is the oldest church in England. The church and St Augustine's Abbey were founded during the early stages of the introduction of Christianity to the Anglo-Saxons. 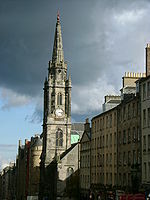 The cathedral exhibits Romanesque and Gothic architecture, and is the seat of the Church of England. i, ii, iii, iv A collection of Neolithic sites with purposes ranging from occupation to ceremony. It includes the settlement of Skara Brae, the chambered tomb of Maes Howe and the stone circles of Stenness and Brodgar. ii, iv The Old Town of Edinburgh was founded in the Middle Ages, and the New Town was developed in 1767–1890. It contrasts the layout of settlements in the medieval and modern periods. The layout and architecture of the new town, designed by luminaries such as William Chambers and William Playfair, influenced European urban design in the 18th and 19th centuries. vii, x Together, the Gough and Inaccessible Islands preserve an ecosystem almost untouched by mankind, with many native species of plants and animals. i, ii, iv, vi As well as the presence of the first example of Palladian architecture in England, and works by Christopher Wren and Inigo Jones, the area is significant for the Royal Observatory where the understanding of astronomy and navigation were developed. ii, iv Saltaire was founded by mill-owner Titus Salt as a model village for his workers. The site, which includes the Salts Mill, featured public buildings for the inhabitants and was an example of 19th century paternalism. ii, iv The Derwent Valley Mills was the birthplace of the factory system; the innovations in the valley, including the development of workers' housing – such as at Cromford – and machines such as the water frame, were important in the Industrial Revolution. The Derwent Valley Mills influenced North America and Europe. ii, iii, iv Created in 1759, the influential Kew Gardens were designed by Charles Bridgeman, William Kent, Capability Brown, and William Chambers. The gardens were used to study botany and ecology and furthered the understanding of the subjects. ii, iii, iv In the 18th and 19th centuries, Liverpool was one of the largest ports in the world. Its global connections helped sustain the British Empire, and it was a major port involved in the slave trade until its abolition in 1807, and a departure point for emigrants to North America. The docks were the site of innovations in construction and dock management. ii, iii, iv Tin and copper mining in Devon and Cornwall boomed in the 18th and 19th centuries, and at its peak the area produced two-thirds of the world's copper. The techniques and technology involved in deep mining developed in Devon and Cornwall were used around the world. i, ii, iv The aqueduct was built to carry the Ellesmere Canal over the Dee Valley. Completed during the Industrial Revolution and designed by Thomas Telford, the aqueduct made innovative use of cast and wrought iron, influencing civil engineering across the world. ii, v, vi Famous for its scenic landscape of mountains, lakes, houses, gardens and parks, the Lake District was celebrated through picturesque and romantic visual arts and literature from the 18th century on. Fountain Cavern, Anguilla - a limestone cavern which contains Amerindian glyphs carved into the rock. ↑ Liddiard (2005), p. 9. ↑ Thornbury (1878), p. 567. ↑ Derwent Valley Mills Partnership (2000), pp. 30–31, 96. ↑ Finlayson C, Pacheco FG, Rodríguez-Vidal J, และคณะ (October 2006). "Late survival of Neanderthals at the southernmost extreme of Europe" (PDF). Nature. 443 (7113): 850–3. Bibcode:2006Natur.443..850F. doi:10.1038/nature05195. PMID 16971951. หน้านี้แก้ไขล่าสุดเมื่อวันที่ 3 ธันวาคม 2561 เวลา 03:33 น.